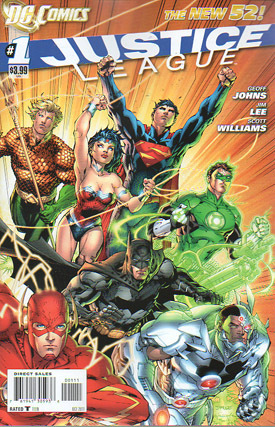 "Justice League - Part One"
This story is set five years ago, when the World's Greatest Heroes were still a mystery to the populace; and the heroes did not know each other personally. Batman is pursuing somebody, and the Gotham City Police Department is pursuing Batman. Members of a SWAT team have decided to target both Batman and whoever he is chasing. From their helicopters, they train their searchlights and assault rifles on Batman. An acrobatic leap gets Batman out of the line of fire just in time. Using his gymnastic skills, Batman takes further evasive action while retaliating with pocket missiles that he keeps handy. The missiles appear to be smoke bombs, designed to blind and deter his attackers, not to harm them. Batman then uses a grappling hook to ensnare and capture the monster he has been chasing. His adversary is definitely not human, and has large and menacing-looking teeth. Closer inspection reveals that the monster may be some sort of alien; either a grotesque humanoid or perhaps a robot. As Batman attempts to interrogate the beast, the monster retaliates with an explosive force that injures Batman in the face and gives the monster the upper hand. Suddenly a bright green energy beam blinds Batman, and then a detailed green construct in the form of a fire truck appears and collides with the monster. This signals the arrival of Green Lantern. Batman and Green Lantern do not know each other, and GL even expresses surprise that Batman exists at all. Batman and Green Lantern compare notes, until the robot-monster emits another explosive force that catches GL off guard and injures him momentarily. The robot then fires destructive energy to take out the pursuing helicopters, but Green Lantern creates green bats to catch the helicopters before they crash. The monster morphs into a creature that slightly resembles a giant insect, although Green Lantern interprets it as a dog. GL is reminded of the Transformers movie. Batman, initiating a kind of turf war, tells Green Lantern to leave Gotham and go back to Coast City. Green Lantern replies that his entire space sector, including all of Earth, is his territory. GL then explains about the Green Lantern Corps. Interrogating Batman further, Green Lantern discovers that Batman has no powers, just his outfit and gadgets and his highly trained but very human abilities. In the meantime, Green Lantern is using his ring to snuff out fires that the creature has started. Green Lantern brags to Batman that he, Green Lantern, can handle anything. As Green Lantern continues to criticize Batman for not having powers, and being "just some guy in a bat costume," Batman uses sleight of hand to remove GL's ring. Hal is not pleased by this stunt, and uses mind control to draw the ring back to himself as the two bicker. Their argument is interrupted when the alien arrives and arms what is initially perceived to be an explosive device. The creature calls out the name of Darkseid, as it detonates a powerful explosion. Green Lantern creates a green safe to protect himself and Batman. The creature was a suicide bomber, and has become a fiery victim of his own weapon. Batman and Green Lantern do not recognize the name of Darkseid, and think it might be a rock band or something. Green Lantern's ring cannot identify the device, and Batman surmises it is an alien computer. The word "alien" makes GL think of "that guy in Metropolis". He wonders if Superman is involved. Batman says Superman is dangerous, and Green Lantern says he can take him. Green Lantern, with Batman in tow, heads to Metropolis to get more answers. The scene shifts to a very lopsided high school football game, Ford versus Mumford. The game is being dominated by one man, who turns out to be Vic Stone, who we know later becomes Cyborg. Vic has several college scouts clamoring to recruit him, but his high school coach wants Vic's dad present. Vic's dad is not an attentive, loving father; and is too busy or too disinterested to show up. One of the students spots Green Lantern's ring-generated jet, heading towards Metropolis. This causes some excited discussion from the students, who mention that there are sightings of the new superheroes more and more. Vic's dad studies them, but does not discuss what he knows with Vic. Green Lantern, carrying Batman, lands his "glowing green jet" in Metropolis. His ring has located Superman, who is inside a building. They land nearby. True to character, Batman wants to study and analyze the situation, but Green Lantern wants to rush in. Green Lantern prefers to go inside alone, believing that Superman is no match for him. Suddenly, a red-blue blur hits or shoves Green Lantern, who is sent hurtling. Clearly, Green Lantern had it backwards. He appears to be no match for Superman. Suddenly, Superman is standing in front of Batman, asking him what his capabilities are. Story - 5: THE DC RELAUNCH BEGINS HERE! By releasing this book on its own, earlier than the other titles in the relaunch, DC Comics is making a very strong statement about the importance of this book. 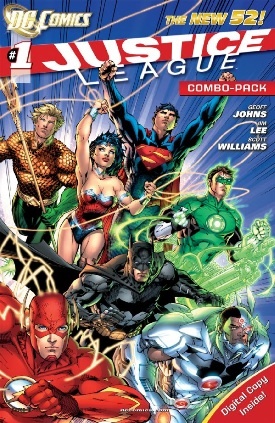 They are saying that the Justice League book is at the center of the new DC Universe. Geoff Johns and Jim Lee acknowledged this during their recent ABC TV interview. 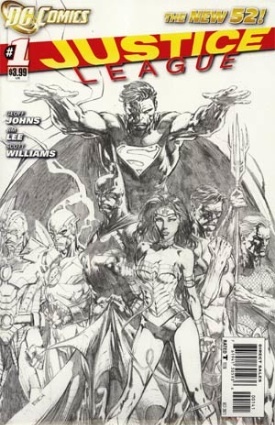 It is also stated explicitly in the Justice League sketchbook that is the bonus material featured in the back of this issue. Justice League is where we get our first glimpse of the familiar yet reimagined heroes. The first several issues occur early in their careers. We will watch them meeting, interacting, and learning to work as a team. Because the Justice League book will once again feature the best of the DC heroes, what happens here should radiate out and affect the individual heroes in their own books. I have to tell you, I had goosebumps when I picked this book up from my comic book shop. I expect to have this same reaction when I pick up Action, Superman, Supergirl, and others. I had a lot of fun reading this book. The familiar characters seemed new and fresh, which I suppose is the whole idea. The interactions of Batman and Green Lantern seemed very natural for two heroes who were meeting for the first time. They seemed very suspicious of each other. Their behavior was very much in character. Batman was cautious and analytical. But Green Lantern was confident, cocky, and impulsive. Batman prefers shadows and stealth; Green Lantern prefers to act boldly and shine brightly. I was glad that Geoff Johns got the writing assignment for the new Justice League. Geoff Johns' strength is his ability to take classic, familiar story elements and rework them in new and creative ways. He also has a flair for writing good character-driven narratives; a must for any good Justice League writer. Some of his best work on the Superman books (the Brainiac story arc in Action Comics; the Superman: Secret Origin series) showcase these strengths. And so does this issue. Geoff Johns is the perfect writer for the new Justice League book. This story was suspenseful throughout; but it also had its lighter moments. I laughed at Green Lantern's suggestion that Batman is "just some guy in a bat costume" with no powers. Batman uses actions rather than words to gain Green Lantern's respect; acting as a super-pickpocket to remove the ring. As a world-class escape artist, it makes sense that Batman would be able to pull off this sleight of hand trick. Another amusing moment came when the heroes failed to recognize the name Darkseid, thinking that "Dark Side" might be the name of a rock band. And I enjoyed watching cocky Green Lantern completely underestimate Superman, and getting a huge surprise in return. I loved the scene where Green Lantern needs to save the police helicopters, and he uses ring-generated bats in honor of his new friend. That scene made me chuckle. DC Comics has promoted The New 52 as a good jumping-on place for new readers. So the target audience for this series is two-fold: new readers and existing die-hard fans. I think both groups will enjoy this book. The final caption announces that next issue will feature "Batman vs. Superman". I can't wait for the next issue! The relaunch is off to a great start! Art - 5: Jim Lee is one of the best comic book artists in the business. And it shows here, in every panel! My favorite image is of course the final splash page as Superman confronts Batman for the first time. We get to see Superman's new costume up close, displaying the much-talked-about new features; the high collar, the thicker "S" on his shield, the removal of his red shorts, and the new red belt. I love this new look; although some people may have a problem with the missing red trunks; a major deviation from the classic look. The only feature that I find a bit displeasing is the appearance of oversized sleeves that are pointy and extend over the back of Superman's hands. That is a rather juvenile look if you ask me; and seems inappropriate for somebody so regal-looking. I hope Jim Lee reconsiders, and changes the pointy sleeves. I also really like the splash on page 8 showing Batman and Green Lantern meeting for the first time. And I love the way Jim Lee renders the ring-generated constructs; probably using digital techniques. For example, the fire truck on page 7 is very detailed, and looks terrific. Cover Art - 5: This cover is amazing! I know that this is the image that DC has been using to promote the relaunch; but it looks great here on the cover! The portrait of each hero could stand on its own; and they look great together! The lines are very clean. This is a dynamic cover, as the young heroes are bursting forth into action. And I love the new logo! This cover is definitely poster-worthy. Cover Art (Variant Edition) - 3: The variant cover by David Finch is not as pleasing to me. Wonder Woman looks good, but the other heroes are all scowling and look very angry. 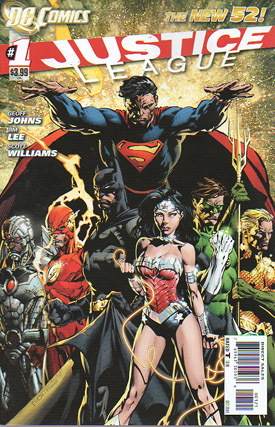 This cover is less dynamic, with everybody (except Superman) just standing around. Superman appears to be initiating flight. I recommend you go with the original cover.